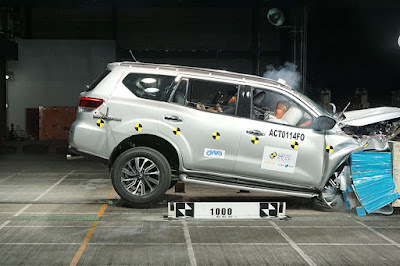 Nissan’s admission that its all-new Terra won’t pass US safety standards is greatly exaggerated as their first-ever 7-seater mid-sized SUV successfully scored a perfect 5-star safety rating, the ASEAN New Car Assessment Program or ASEAN NCAP revealed recently. Scoring 83.17 points out of a possible 100, the Terra’s result was one of the main highlights of the 2nd Conference of ASEAN Road Safety or CARS 2018. The seven-seater SUV performed reasonably well in the Adult Occupant Protection (AOP) in which it obtained 44.70 points. Under the Child Occupant Protection (COP) category, the Terra model scored 20.79 points where it performed remarkably well in the dynamic test (frontal and side crash test) by achieving full points in that particular assessment. As for the Safety Assist Technologies (SATs), the model gained 17.69 points with Seatbelt Reminder System (SBR) as standard across variants. The Nissan Terra is fitted with six airbags as standard for Thailand, Indonesia, Brunei, and the Philippines. Nevertheless, for side and curtain airbags, they are only available as an option in Cambodia, Laos, Myanmar and Vietnam. Electronic Stability Control (ESC) comes as standard in this SUV with an exception of Vietnam and the Philippines market whereby it is offered only in higher variant. In addition, there are several other technologies made available in the Nissan Terra as optional fitment namely Blind Spot Technology, Lane Departure Warning and Nissan’s very own safety technology called the Intelligent Rear View Mirror. ISOFIX and top tether are fitted as standard in this SUV model.